Release your expectations. Shake loose the rules that hold you rigid. 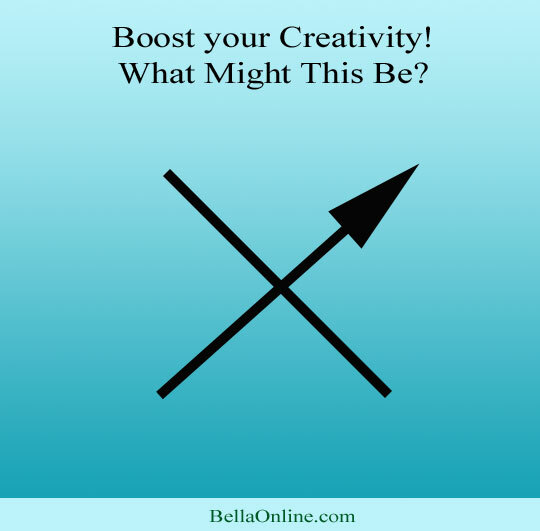 It's time to boost your brain's creativity! Daily practice can make enormous strides in how well your brain functions throughout your challenges and projects. Take in a deep breath, and then examine the image before you. This creativity image involves a pair of crossed black lines. The line in the top right has a triangle at the end of it. What does this represent to you? Some answers might come immediately, and almost seem obvious. Make note of those! Then go wild. What else might it be? What if you looked at it upside-down? What if the colors were different? What if you were only three years old? Come by our forums, Facebook page, and other feeds to share your thoughts! We eagerly want to hear from people around the world, from different ages, different cultures. Get those creative juices flowing!